Meghalaya, the land of floating clouds is an incredibly beautiful tourist destination in India. It is one of the Seven Sister States of Northeast India where natural beauty is found in plenty. The two colours which beautifully describe Meghalaya are white and green. Its lush green landscapes, picturesque surroundings and white clouds and mist playing an enchanting drama never fail to capture the hearts of tourists. It would be no exaggeration if we call Meghalaya a 'dramatic land'. The term 'Meghalaya' means 'the Abode of the Clouds'. 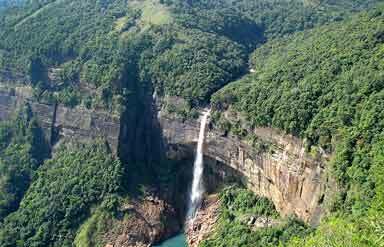 Plan a Meghalaya Tour and experience and enjoy the mesmerizing beauty of nature at its best. Shillong is the capital city of this state. The history of this state goes back to the tribes of Jaintya, Khasi and Garo which were the first inhabitants of this state. It is a lush green town which boasts of receiving the highest rainfall in the world. Located in the East Khasi Hills in the state, this town teems with lush green vegetation. It is also famous for its rich culture. The other known attractions of Cherrapunjee are the limestone caves, waterfalls and honey. It also finds mention in the Guinness Book of World Records. Meghalaya is famous for its fascinating caves which are a big hit with tourists. 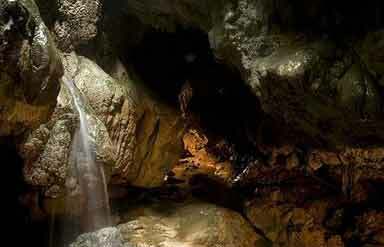 The Mawsmai are the most famous caves of the state which are located near Cherrapunjee. Made of limestone, these caves are known for the formation of stalactites (a cylinder of calcium carbonate hanging from the roof of a limestone cave) and stalagmites (a cylinder of calcium carbonate projecting upward from the floor of a limestone cave). And these formations result in joining of the roof and the floor forming pillar like structures. Nohkalikai the fourth tallest waterfall in the world is a major attraction of this state. Located near Cherrapunge, it cascades from a height of 1100 feet offering a breathtaking view. The other famous waterfalls are Seven Sister Falls, Elephant falls, Sweet falls, Spread Eagle falls and Crinoline falls. It is a picturesque lake offering great adventure facilities. 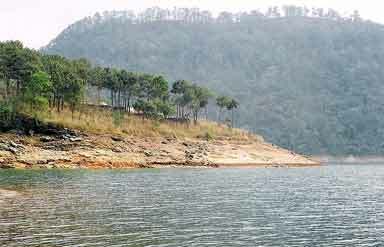 Located near Shillong, this lake is a famous picnic spot where one can enjoy adventure sports like kayaking, boating, scooting and water cycling. The lake also has a floating restaurant where you can enjoy delicious meals. And if you wish to stay near the lake, then the same can be arranged. There is an Orchid Tourist Home overlooking the lake which is a government run hotel. 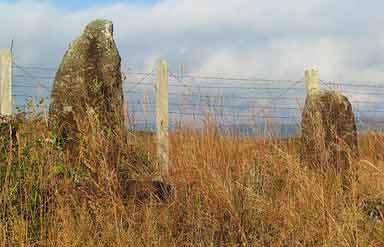 The Khasi Hills are dotted with several wonderful monoliths steeped in glorious history. Majority of the monoliths were built in honor of some special people. Jowai is a mesmerizing town enveloped in sheer natural beauty. Its arresting rivers, waterfalls, gorgeous landscape, beautiful valleys and refreshing vegetation make it a must-see destination. Meghalaya is a perfect destination for enjoying the pleasure of trekking. It offers great trekking routes offering amazing surroundings and attractions like flora and fauna. Majority of the population of this state consists of tribes which are expert in making amazing handicrafts. The markets are lined with shops offering a variety of handicrafts such as cane mats, cane baskets, carpets, pineapple fiber articles, silk fabric, tribal jewelry and bamboo and cane objects. Several types of accommodation options are available in Meghalaya starting from the luxury hotels to budget hotels. Most of the hotels are located in the capital city of the state. The people of Meghalaya are more tilted towards meat, especially pork. It is an ingredient of most of their dishes. Don't forget to try out Jadoh, a delicious dish made of meat and rice. Also try Kyat which is a local brew of the state. By Air: Guwahati is the nearest airport, 128 km away. It connects to the main cities of the country like Delhi, Mumbai, Chennai and Kolkata. By Rail: The nearest railway station is Guwahati which is well connected with the main cities of the country. 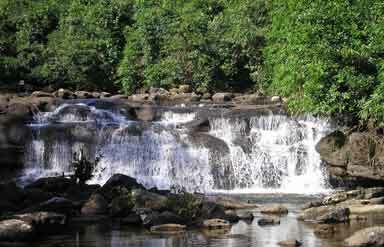 By Road: Meghalaya is easily accessible from Assam and other major cities of India. 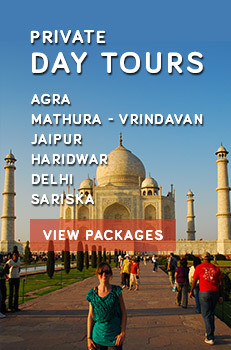 Caper Travel India offers a wide range of North East India Tour Packages. For more details send us query.